How do you know if your friends actually like you? Joni, Deb, Eden and Trina try to catch up once a year for a girls’ getaway. Careers, husbands and babies have pulled these old high-school friends in different directions, and the closeness they once enjoyed is increasingly elusive. This year, in a bid to revive their intimacy they each share a secret in an anonymous letter. But the revelations are unnerving. Then a fifth letter is discovered, venting long-held grudges and murderous thoughts. But who was the author? And which of the friends should be worried? 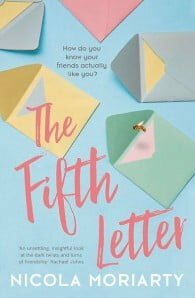 The Fifth Letter is a searing examination of the bonds of women’s friendship groups, the loyalty and honesty they demand, and the pain of ending relationships that once seemed essential but might be outgrown.